Carports vs. Garages: What’s the Difference? It’s generally a bad idea to leave your car outside in open-air parking for long and regular periods. They’re all right for a quick jaunt to the store or a few hours at a friend’s house, but if you want to give your car the safety and storage space it requires, you need to build either a garage or a carport. But which one should you choose? In areas like Sunshine Coast, carports are common since the cars there are often taken out so often that it makes more sense to just build a carport. It’s in stark contrast to other areas around the world like the United States, where other concerns such as shifting weather patterns can lean the design choice toward building garages. Of course, you have a better idea of how you’ll use your car and the environment that you’ll leave it in — so which one should you choose? One of the biggest advantages of a garage is that it can offer more protection than a simple carport. As you’re literally building another room for your car, you can make sure it’s well-protected against things that carports can’t cover, such as wind or snow. A garage can also become another room in a pinch, or if you have things that you need to store that can’t fit into your house. Having a garage can be considered as another room extension, and can be repurposed as such if the car isn’t there. However, the most obvious drawback to this is cost and maintenance. Since you are building a garage as an extension of your home, there will be a big cost associated with construction and upkeep. This is slightly mitigated by the possibility of repurposing the room but is still a very big upfront expense for you to consider. On the other hand, carports are light, sturdy, and can protect your vehicle from the most obvious and common elements: sun and rain. They’re easier to attach to your house and can be made from a variety of materials that you can easily source around the local area. A carport can also be converted into another outdoor area of the house. 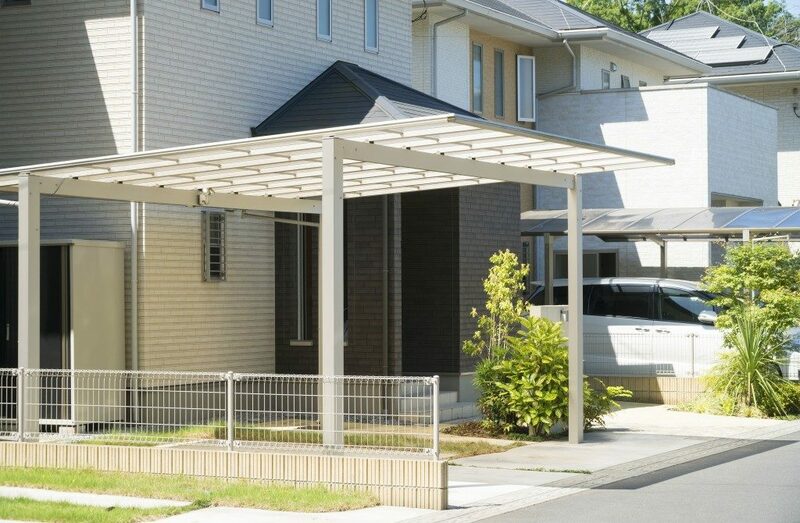 Plenty of carports get turned into patios since the covering can function as a pergola in hot weather — in fact, plenty of pergolas serve dual purposes of both patio and carport — and can provide much-needed shade during the hot summer months. Since it’s simply an extension of your roofing, a carport isn’t able to provide as much protection from the elements like a garage does. Things like strong wind and snow are definitely a concern when you construct a carport, as well as the decreased security since it’s still easily accessible from the outside. Ultimately, it’s up to you or your contracting company to decide which type of structure is best. There are many factors to consider, such as your neighborhood’s security, the type of car you have, the space available to build on, and even the climate in your area. Knowing these factors in combination with the advantages and disadvantages of each can help you make the right decision.